Born and raised in Western New York State. Jon Southwell began his acting career at Notre Dame High School. He joined the drama club as well as the photography and library club. The acting continued during a stint with the United States Air Force. Mr. Southwell became a member of the Tombstone Wild Bunch, spending weekends in Tombstone, AZ performing in Wild West shootouts. He portrayed characters such as Curly Bill Brocius, Billy Clanton and Doc Holiday in The Gunfight at the O.K. Corral re-enactments. After several years of the Wild Bunch shootouts, Jon ran off to join another wild bunch-the circus. He was a roustabout traveling the west coast with the Ringling Brothers and Barnum & Bailey Circus. His circus days were short-lived to return to Arizona where he completed his degree in Dramatic Arts. 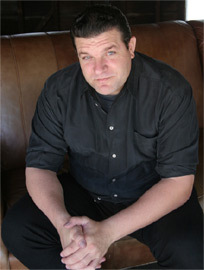 His budding acting career was nurtured by appearing in multiple college and community productions: The Lost River Theater Project as McCann in The Birthday Party; The Quintessential Stage as Johnny in Misalliance, Grumio in Taming of the Shrew, Orrin Kinnicott in Biography and Chief of Police in Accidental Death of an Anarchist and Borderlands Theater as Manrique in Fuente Ovejuna, Pedro Tercero Garcia in La Casa de los Espiritos delivering a bilingual performance in Spanish and English. Jon has also appeared in several television spots on Public Television and The Travel Channel. With a pretty varied resume, he moved to the aspiring actor’s infamous promise land of Los Angeles, California. Where he graced the sets as human furniture in Norm, NYPD Blues, ER, Jack and Jill and The Fast and the Furious. Always up for more challenging roles, Jon worked on the films El Macho vs. The Canadian Mummies of Mars, The Inheritors, A Little Light, The Sound of Silence, The Red Machine, Ghost Hoax and a music video, So Stay In Love. Jon lives and works in L.A. enjoying the Southern California weather, teaching himself to surf, being an avid motorcyclist and in constant search for the role of his lifetime.